A “next generation” textbook for online writing and design, Internet Invention supplements existing print and web primers on HTML and graphics production with a program that puts these tools and techniques to work with a purpose. Designed as a passage from the more familiar rhetoric of the page to the less familiar one of the screen, this text is a hybrid workbook-reader-theory with chapters divided into the following sub-genres: Studio, Remakes, Lectures, The Ulmer File, and Office. These sections offer a sequence of interconnected Web writing assignments, rhetorical meditations, scholarly discussions, case studies, and pedagogical metacommentary, which together combine to form a truly unique contribution to the body of rhetorical theory and practice in the age of the digital text. 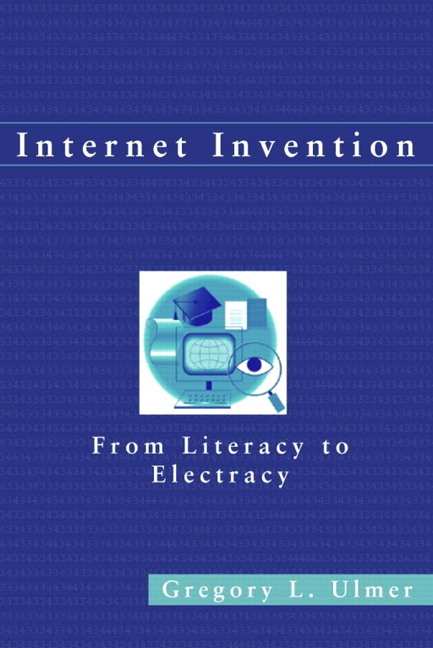 Ulmer uses the invention of literacy by the Ancient Greeks as a model for the invention of “electracy” (which is to digital media what literacy is to print). Internet Invention brings the students into the process of invention, in every sense of the word. The book takes students through a series of Web assignments and exercises designed to organize their creative imagination, using a virtual consulting agency — “The EmerAgency” — as a vehicle for students to discover the potential for the Web to act as a setting for community problem solving. Studio: An integrated set of assignments and exercises for Web site authoring, supported by readings, descriptions, and models based on important works of literature, art, popular culture, and critical theory. Remakes: These sections demonstrate how to use the methods of image reason by bootstrapping electracy out of existing classics of arts and entertainment. Lectures: Scholarly discussions on the background, context, and rationale for the project and assignments. Ulmer File: Describes and demonstrates the author's own performance of the assignments, adding to the background on how the pedagogy evolved. Office: Informal comments, asides, and clarifications are distributed throughout the chapters, of the sort one would find in email, frequently-asked-questions files, or instructors manuals. Companion Web site: Correlated with the table of contents, the Web site features student samples from Ulmer's classes, with analysis, commentary, and step-by-step instructions for the assignments. V. EMBLEMS OF WIDE SCOPE. 10. The Ideal of Value. Conclusion: Culture War or Syncretism?